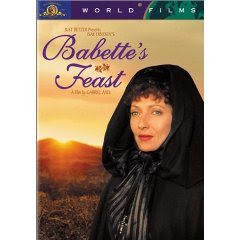 Some friends came over tonight for our bi-weekly Foodie Films event... where we watched Babette's Feast. This was a continuation of French fare as the movie highlighted some French cuisine. The movie won an academy award for Best Foreign Film, however after watching it, we weren't really impressed with it. Perhaps it was because we watched the movie in English... when it may have been better to watch it in French with English subtitles.